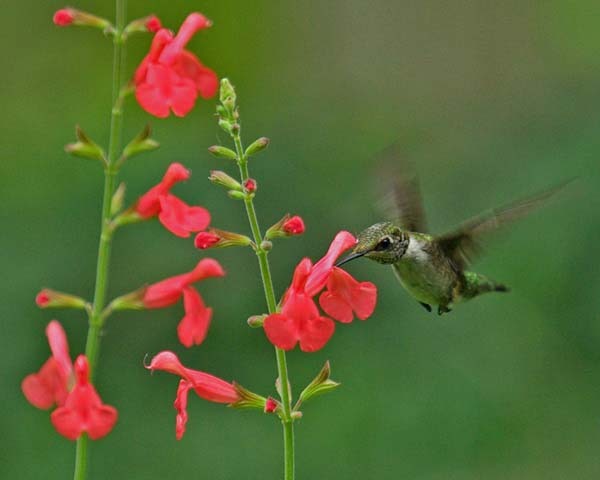 Depending on where you live, September may be a time to keep busy planting perennial Salvias or to hunker-down and plan recovery of buildings as well as gardens following storm damage. Peak hurricane season lashes the Gulf Coast and Atlantic seaboard through October. It's unlikely that anyone in Houston will want to name a baby Harvey for a long time after the 2017 season. We're deeply concerned for the city's suffering and the damage it must overcome. Along with basic tips for late summer/early fall gardening, you'll find a bit of information here about landscape reclamation after severe weather. 1) Transplant but don't divide. The warm soil and cooler days of late summer and early autumn are good for planting many Salvias. Wait until spring to divide sages, but now is a good time for transplanting if a perennial sage is surviving but not thriving in its present location. Remember to water transplants as well as you would new plants. Also, it helps to cut back foliage a bit so the roots aren't overworked. 2) Continue watering. For established plants, provide deep watering -- a slow application of about an inch of water -- at least once a week if there is no rain. Observe individual Salvias for wilting or signs of overwatering (such as yellowing leaves and overly lax foliage) and adjust irrigation to meet their needs. Don't forget to fill birdbaths. 3) Adjust sprinkler schedule. If you use an overhead sprinkler system and water in the cool of night, adjust watering times to pre-dawn so foliage can dry out during the day. This helps avoid mildew. 4) Watch out for drying winds. If local climate includes drying winds, such as the Santa Ana kind in Southern California, increase watering. 5) Remove spider mites. Chances are that spider mites are still active if it remains hot and dry where you live. Wash away the mites and their silky filaments with a powerful spray of water. 6) Refresh planters. Refresh some of the soilless potting mix in containers. Add new, fast growing Salvias, such as Mountain Sage (Salvia microphylla) and Mexican Bush Sage (S. leucantha). 7) Avoid fertilizing. Don't add fertilizers containing nitrogen now, because it can reduce cold weather hardiness and cause winter injury. 8) Add compost to garden plantings. By adding a spadeful of compost around established, in-ground plantings, you nourish Salvias and feed earthworms that aerate, loosen and enrich soil. 9) Preserve kitchen sage. Harvest kitchen sages for drying, such as Salvia fruticosa and S. officinalis, early in the day after dew has dried. This is when volatile oils are strongest. 10) Harvest seeds. Gather seeds when Salvia calyxes and bracts dry. Leave some for songbirds to dine on during winter. 11) Take cuttings. Autumn is not too late to grow cuttings for transplanting. In mild-winter areas, you can transplant them outdoors after root balls develop. In cold winter areas, when your transplants are well established, store them in a cool (not freezing) and well-lit location, such as an enclosed porch, garage, cold frame or greenhouse. Here is an FBTS video about soft tip cuttings, which is similar to creating cuttings of soft, herbaceous Salvias. Root Simple also offers a good explanation of the process. 12) Prepare for winter mulching. Save autumn leaves if you live in a cold-winter area. A thick blanket of leaf mulch applied to Salvias helps roots to survive freeze-thaw cycles. Remove it in spring when hard frost is unlikely. It's true that most Salvias have trouble surviving prolonged periods of wet roots. But don't give up immediately after storm waters and winds subside. Here are some ideas for rescuing landscaping. 1) Avoid soil compaction. After removing floodwater debris from your landscape, walk as little as possible on garden areas to avoid soil compaction. At minimum, this will aid planting of replacement Salvias. 2) Monitor plantings that remain. If it appears that a plant may survive, wash silt away and observe for new growth. Give a struggling sage a few weeks before deciding to replace it. 3) Be patient with woody Salvias. Don't rush into major pruning if you don't see leafy growth on woody Salvias. Gently bend branches for signs of pliability and lightly trim small branches to check for signs of a green, inner core. Call or write to us at Flowers by the Sea with any questions you may have concerning Salvias. In addition to our own growing experiences, we've gathered information from sage gardeners nationwide and are always willing to share what we know.